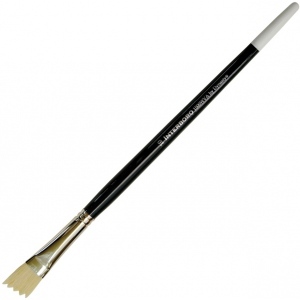 Excellent for heavy bodied oils and acrylics. * Made with the finest pure white Chungking bristles interlocking construction and long natural flag to move heavy bodied products flawlessly. * Long nickel-plated seamless ferrules are double crimped to ensure adhesion. * Handles are constructed from long white birch double dipped kiln-dried emerald green and white handles for a distinctive balance.